Your social media feeds must be full of ‘What to watch’ lists and if you’re someone who is eager to stay updated with all the most happening tech trends, you should pause at ‘Which tech trends are on the horizon’. It is vital for anyone to recognize the technology which is currently becoming popular so that you too can allocate your funds and time to include those trends in your business and see your business prosper in the present commercial environment. The New Year 2017 handled few of the top trends in digital transformation coupled with few key trends in Digital Transformation. 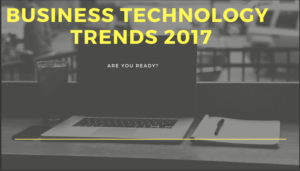 But as the CES 2017 is upon us and since this is no longer a consumer show, we simply can’t ignore the business and enterprise tech trends which came into existence post the CES. Let’s take a look at the few vital tech trends which you should take into account. This year we will bid goodbye to cloud adoptions and we’ll welcome cloud-first strategies. There will be noteworthy benefits for businesses which invest in cloud-first technology and they may include reduced equipment and hosting costs, increase in capacity, better collaboration, streamlined operations and better productivity. In fact, business owners definitely believe that cloud-first is the ultimate key to maintaining an agile company. We all expected Pokémon Go to transform the way we thought Augmented Reality and Virtual Reality works in the market of ideas. In the year, we will see VR and AR devices becoming more mainstream and there will be VR and AR devices during the initial stages of development. But you should expect newer versions of Virtual Reality and Augmented Reality to be seen everywhere in the coming year. Moreover, Amazon Go has hit the ground by using this kind of technology. This is undoubtedly the world of Internet of Things and security should be agile for all the devices that people use. It should be both adaptive and fluid. Web designers should consider cyber security during the initial development of application, enterprise structures and solutions. Entity behavior analytics can be needed throughout all enterprises and hence multi-layered measures will definitely be the order of the day in 2017. In a small scale, you must have been working with intelligent apps regularly. Virtual personal assistants or VPAs are one such example. They are one of the smartest apps which change businesses by customizing processes of workplace like prioritizing mails and content. The year 2017 will see a sudden popularity of intelligent apps which will work beyond assistants. Security software will have Artificial Intelligence capabilities and by using AI, the enterprise can concentrate on advanced analytics, conversational interfaces and autonomous business processes. In fact, there is a prediction that the largest 200 companies in the world will use intelligent apps by the end of 2018. This is going to be a big deal for some of the vital industries like title registry, music distribution and identity verification. If you didn’t know what blockchain is, it will be a distributed database where bitcoins are listed in blocks and this prevents tampering of data and increases trust and transparency. In 2017, there will be many blockchain initiatives during the initial phases. So, if you want to stay on top of the competition around, you should follow the trends given above so that you can leverage them and get best performances and results. Machine learning is going to be yet another trend which you can watch out for.